STUART, Neb. -- Stepping carefully through a 12-foot-deep canyon gouged into the sandy soil of their family ranch by a long-gone storm, Kurt and Laura Meusch ask a Shakespearean question: What's in a name? The slice of their pasture now set to host the Keystone XL oil pipeline, which TransCanada Corp. agreed to steer around what Nebraska officials mark as the delicate dunes of the state's prized Sand Hills, feels no different to the Meusches than the ground the company was pressured into sidestepping. A sandy hill without the Sand Hills label doesn't ease the threat that they and their vocal neighbors say the new pipeline path poses to their water. "It's not just running through our backyards; it's running through our entire lives," Laura Meusch said of Keystone XL during a slow trip through meadows where locals warn that a lone pickup truck can cause a "blowout" of unsettled soil. "They just think we're a bunch of hippie environmentalists out here," added the registered Republican, who recently began locking her doors for the first time on the property that her husband's family has owned for decades. "No. We're not." Laura's opposition to the $5.3 billion pipeline, hotly sought by an oil industry eager to bring landlocked heavy Canadian crude to the Gulf Coast, runs so deep that she would leave her land before construction begins. Her husband does not go that far. But both Meusches agree that TransCanada would have to use eminent domain powers in order to lay 36-inch pipes across their property. Even Nebraska's representatives in Congress depict the Cornhusker State's debate over Keystone XL as largely settled thanks to its new route with the nation's attention turning to whether the Obama administration will approve the project next year and GOP efforts to force a green light before Election Day. Traveling through conservative Holt County, however, reveals much to contradict Washington's sense of a pipeline compromise. Alternately driven by false rumors, more grounded fears and a burgeoning connection with unexpected allies on the political left, Keystone XL's local critics are restocking their rhetorical ammunition for a fresh battle to stop, or at least move, the pipe. These Nebraskans' weapons against what they view as a state government corrupted by TransCanada's influence may go beyond the rhetorical. Quips in the county about lying down in front of bulldozers to get the nation's attention are followed by subtle warnings that some could keep the company off their land by force -- what Kurt Meusch called the "old school" method. "We've taken care of the ground. We baby it," Laura explains, passing areas of her ranch where the water table from the vast Ogallala Aquifer varies from far below to just beneath the 4-foot opening for the pipeline to sit underground. "Yes, we have areas that aren't" marked by wind-tossed pockets of sandy Valentine soil, estimated by federal officials to cover more than 5 million acres of Nebraska and South Dakota, "but most of the area they cross is still Valentine," she adds. "It's still Sand Hills." The Nebraska Department of Environmental Quality (DEQ) looked at several other maps before settling on a Sand Hills boundary used by a joint state-federal catalog of U.S. eco-regions in 2001, according to Director Mike Linder. He does not dispute the Meusches' concern that Keystone XL construction could still occur in soil as challenging as any in the state. 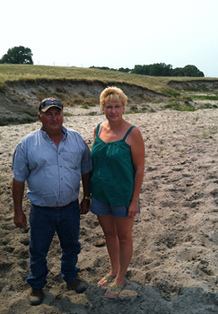 Kurt and Laura Meusch stand inside a deep, sandy "blowout" near a standing water source on their ranch outside Stuart, which the new route of Keystone XL is expected to cross. Photo by Elana Schor. "We freely admit that there are still characteristics of the Sand Hills outside of that area, and so we'll have to deal with that as the route gets more further defined by TransCanada," Linder said during an interview at his office in the state capital of Lincoln. What Linder cannot do under Nebraska's new routing law is review or suggest alternative routes for the pipeline, a choice that would please more than a few Holt County opponents who care more about getting heavy Canadian oil away from the Ogallala than keeping it out of the entire country. The State Department plans to release an environmental impact statement next year that looks at alternative routes, an aspect of the pipeline's previous three-year-long review marked as potentially weak by the department's inspector general (Greenwire, June 15). Yet the federal and state reviews are compounding the complexity of the controversy that already shrouds Keystone XL, thanks in part to a phenomenon that TransCanada spokesman Shawn Howard and anti-pipeline Nebraskans can agree on. "People have used the Ogallala Aquifer and the Sand Hills interchangeably," Howard said in an interview. When 53-year-old nurse Cindy Myers makes that point, offering a glass of crystal-clear Ogallala water on a humid Sand Hills evening, she is trying to steer the anti-pipeline fight she has anchored since 2009 back toward protecting the aquifer, which provides drinking and irrigation water for almost all of Nebraska. When Myers first heard about Keystone XL, she recalled, "I thought, 'They'll learn about our water and not go through here.'" When Howard makes that point, he is trying to remind the state's ranchers that more than 1,000 miles of oil pipelines already cross the Ogallala, including the original Keystone line that many Nebraskans still want to see XL parallel. Pipeline foes counter that existing oil transportation above the Ogallala occurs in places where the surface-to-water distance is great enough and the sandy soil is impermeable enough that an oil leak is much less likely to put residents at risk (see attached map). But such nuance has little space to take root in the bare-knuckle politics of a clash that has driven the 2012 election's energy debates. Both sides of the pipeline chess match have gained at various moments from the conflation of the Ogallala with the Sand Hills, characterized by U.S. EPA as containing primarily the permeable Valentine soil that is also found on the Meusch's ranch. TransCanada would employ the same construction techniques it committed to using for Sand Hills impact mitigation during the State Department's first round of Keystone XL review if it is granted approval for the new route, Howard said. "We're not saying you may not have any contact with potential groundwater" while laying pipe along the path through Holt County, he explained, "but we have to put plans in place to make sure it's protected while we're doing this construction, and the design of it takes that into account." To demonstrate the company's experience building pipe safely through environmentally sensitive places, Howard pointed to its recent approval from the Army Corps of Engineers to cross sections of wetlands in Texas where the southern third of the original $7 billion Keystone XL project is going forward with President Obama's blessing. That review of the now-renamed Gulf Coast Project is drawing condemnation from environmentalists who want to see a slowdown in development of oil sands crude (Greenwire, May 23). For every Kurt Meusch or Cindy Myers, there are more silent supporters of the pipeline in the state who discount fears that a leak from Keystone XL would damage either the Ogallala or the Sand Hills. "It's about as paranoid as you can get," said Rex Weller, 67, a member of the board of supervisors in central Nebraska's Merrick County. Pipeline critics who pushed to move its route out of the Sandhills now lament that TransCanada's compromise path, based on an EPA-developed map, still runs crude through sandy soils and high water tables. Click the map for a larger version. Map courtesy of Bold Nebraska. Even as he blamed "not in my backyard syndrome" for allowing more liberal organizers to enlist lifelong Republicans against the pipeline, Weller acknowledged that "you can't have a project like this and say there's never going to be a leak somewhere, because there will be." While Weller trusts TransCanada, offering a pro-pipeline resolution that passed his board unanimously last year, Laura Meusch looks at her hay meadow and sees a risk that no oil company could convince her is worth it. "They're not all going to shoot in the air. They're not all going to seep to the surface where we can see them," she said of potential leaks from Keystone XL. The State Department's review projected that a "pinhole" leak similar in size to one blamed for a 2011 oil sands crude spill in Canada could fail to trigger TransCanada's leak detection system if it fell below 1.5 percent of the flow. The Obama administration's analysts took a more confident tack in predicting risks to the Ogallala as part of their most recent round of Keystone XL review. 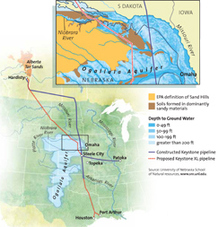 "Experience from previous oil pipeline releases in shallow groundwater areas with conditions similar, although not identical to those within the [aquifer] indicates that the impacts from even very large spills would likely be limited to localized groundwater contamination that would not threaten the regional viability of the aquifer system," they wrote.